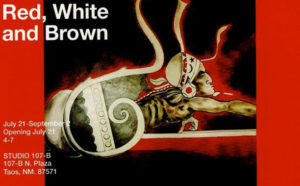 At Maye’ Torres gallery, STUDIO-107-B, on July 21, Saturday, during Fiesta from 4 to 7, your hostess presents “Red, White, and Brown,” a Taos commentary on the visual arts from the artists, named below. In effect, Maye is injecting the “Soul of the Southwest” with a necessary reminder of identity on the historic Plaza, El Corazon de Taos. The visual arts manifest the spirit of what Heidegger might call “essential strife” wherein the object embodies the repose and motion of earth and world that emerge in a work of art. Essential strife might also characterize the funky authenticity of Taos. Just as Taos Pueblo has emerged from the earth in its architectural adobe glory among these historic peoples, so the art work below reflects the resonating spirit of nature and the cosmos, whether in the play of surface and color, the cosmos in geometric figures, or the subtle shapes and colors that form impressions and representations of that which can be seen and not seen as the unknown unfolds, touching the eye with beauty or the heart with feeling. Like her grandfather, who presided over a shop that sold local, regional, mainstream and radical news periodicals in the sixties and seventies, along with books, booze, and tobacco, so Maye’ has revived the art scene in plain sight for those who can see and hear the spirit of art, a spirit manifested in objects. According to archeologists, the spirit of art existed more than a thousand years ago among the indigenous Taosenos, whose work existed not just as devotional objects but as art, as a way of fulfilling the creative and imaginative spirit. While the “Broken Wheelers” or Taos Society of Artists began the modern marketing and public relations campaign, so the indigenous visual and performance artists, including Taos Pueblo natives and the Hispanic-Catholic santo and retablo makers, not to mention adobe makers and builders, expressed their own creative spirit in shaping the place and people, a place which continues to attract newcomers and natives. In this otherwise chaotic nation-state, one sees hope in this eloquent presentation. Even as Fiesta has become a kind of homecoming so Maye’ brings back in contemporary guise the spirit of Taos. Viva Fiesta. Viva Maye’. S.O.S. Help a working girl! “Would love it if you could come play in the adobe with us. Come for all three days, a day, or a few hours.” Friday, Sat, Sun, July 20, 21, 22nd. 9:00-4:30.